Eligo Energy apologizes for any irregular electric utility billing that you may have experienced recently. Eligo is committed to providing a smooth customer experience, and we understand the impact that irregular billing has on household budgets. In an effort to regain your trust, Eligo is offering active aggregation customers $10 utility bill credits. To claim your credit, please fill out the form available at www.eligoenergy.com/Evergreen by 10/31/17. 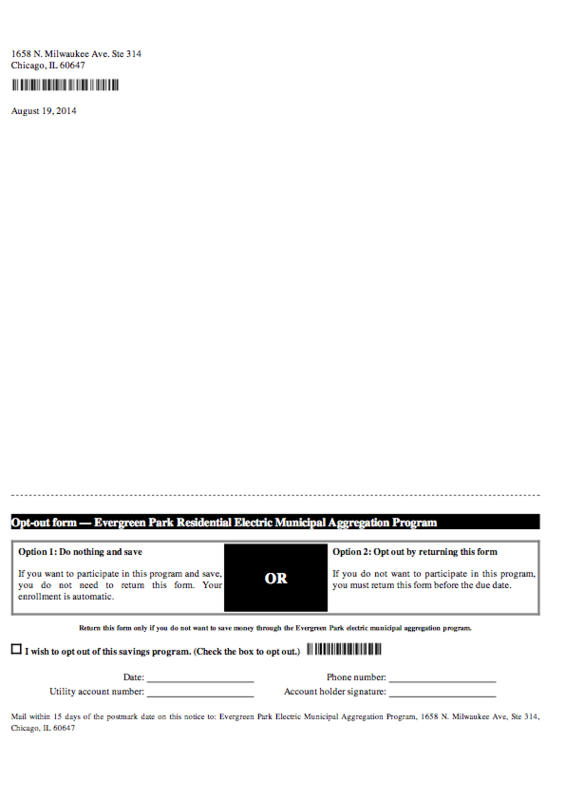 To qualify for the bill credit, you must be an active Evergreen Park municipal aggregation customer. 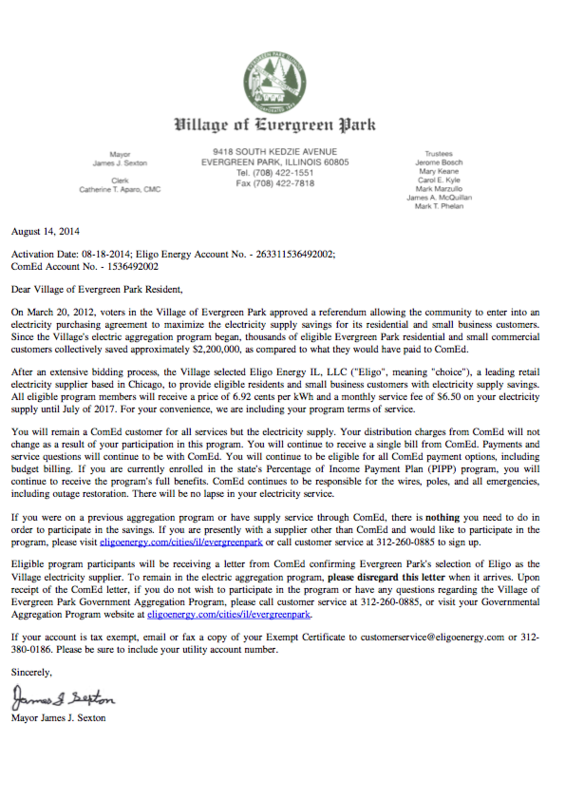 Evergreen Park residents may also be eligible for a utility bill payment plan. To learn more and sign up, please take the following 3 steps: 1) call 1-800-Edison-1; 2) identify yourself as Evergreen Park municipal aggregation customer that experienced delayed billing; and 3) ask to be enrolled in a monthly payment plan. We again apologize for the inconvenience. We understand that you have a choice when it comes to electricity providers, and we appreciate your continued business. Welcome Village of Evergreen Park Residents! Eligo Energy, a leading retail electricity supplier based in Chicago, is proud to have been chosen as the Village of Evergreen Park Municipal Aggregation Program electric supplier. On March 20, 2012, voters in the Village of Evergreen Park approved a referendum allowing the community to enter into an electricity purchasing agreement to maximize the electricity supply savings for its residential and small business customers. Since the Village's electric aggregation program began, thousands of eligible Evergreen Park residential and small commercial customers collectively saved approximately $2,200,000 as compared to what they would have paid to ComEd. As part the Village of Evergreen Park Municipal Aggregation Program, Eligo Energy is providing you the opportunity to join other residents to save money on the electricity you use. The Aggregation Program fixed price available to all eligible Evergreen Park residential and small commercial customers is 6.92 cents per kwh and a $6.50 monthly service charge starting from your first applicable meter reading and expiring in July 2017. There is nothing you need to do in order to participate in the savings. We will automatically process your enrollment, unless you return the opt-out form that you received by mail within 15 days of the postmark date on the notice or rescind your enrollment within seven days of receiving a letter from ComEd. If you have questions about the Village of Evergreen Park Municipal Aggregation Program, please see Frequently Asked Questions and Terms and Conditions sections. You can also call us at 312-260-0885. As an eligible member of this program, you will automatically receive a price of 6.92 cents per kilowatt-hour (kWh) as well as a $6.50 monthly service charge starting from the first applicable meter reading and expiring in July 2017. Residential or small commercial customers located in the Village of Evergreen Park may participate. A "Small Commercial Customer" is a retail customer with an annual electricity consumption of less than 15,000 kilowatt-hours. Customers enrolled in real time pricing, Power Smart Pricing, electric space heat rate, or served by an alternative retail electric supplier are eligible under the law, but are not necessarily automatically enrolled. If you are in one of these programs or are presently with a different supplier, you will need to review your pricing and contractual obligations in order to determine which options are available to you at this time. You may always call us with any eligibility questions at 312-260-0885. How do I enroll in the Aggregation Program? Is there a Green Energy option under Aggregation Program? 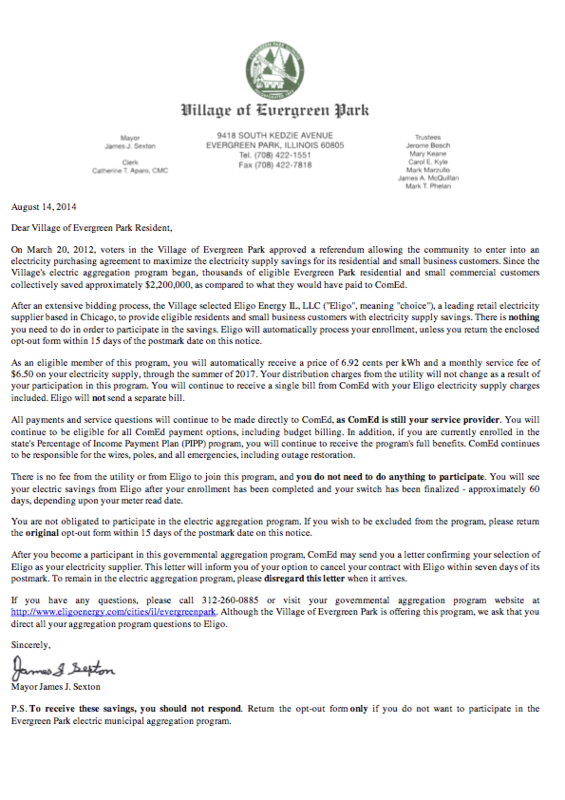 Do I have to participate in the Village of Evergreen Park Municipal Aggregation Program? You may request to join the program online at http://www.eligoenergy.com/cities/il/evergreenpark or call 312-260-0885 for enrollment information. You may also visit www.eligoenergy.com for other rate plan options. Program terms and conditions may differ from the aggregation program. Enroll online at http://www.eligoenergy.com/cities/il/evergreenpark or call 312-260-0885 for information about how to switch to the more favorable rate negotiated on your behalf by the Village of Evergreen Park. No one from Eligo Energy or the Village of Evergreen Park will ever visit your home to sign you up, or call you to enroll. If someone calls or visits your home, that person is not from the Government Aggregation program. Residents of municipalities that enrolled in aggregation programs over the last three years in the State of Illinois are reporting no negative issues and are generally pleased with the reduced rates on their electric bills and rate stability. Deregulation of energy in Illinois has resulted in downward pressure on prices across the State. Since the Village's electric aggregation program began, thousands of eligible Evergreen Park residential and small commercial customers collectively saved approximately $2,200,000 as compared to what they would have paid to ComEd.